Most people are generally familiar with the idea of pre-marital or prenuptial agreements. Even if they do not know the details of how such agreements work, they may know that such agreements are made as a way to protect the individual wealth of one or both spouses. Fewer people are aware that couples can sign agreements similar to the prenuptial agreement after they are married. When these agreements are entered into after marriage, they are known as postnuptial agreements. A postnuptial agreement is an agreement between a married couple that outlines the couple’s agreement as to how their assets would be divided in case of divorce or separation. Like prenuptial agreements, postnuptial agreements cannot deal with issues or child custody because what happens to a child after a divorce or separation is a question for a court. Child custody and visitation issues must be resolved by a judge after considering the child’s best interest. A couple may decide a postnuptial agreement is needed after certain issues arise after marriage. For instance, if one spouse is starting a business using an inheritance, or if one spouse is unfaithful and in exchange for reconciliation the spouses agree that in the event of a divorce the other spouse would receive certain assets. Whatever the reason, if both spouses are in agreement, a postnuptial agreement can be helpful in making a divorce proceed faster as the property issues would already be resolved. Pennsylvania law allows for married couples to enter into agreements settling their property rights even after they are married. 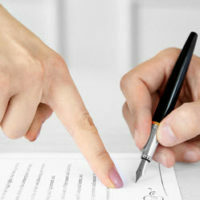 If there is a dispute as to the terms of a postnuptial agreement, the court looking at the agreement first considers the language used in the agreement and how it conveys the intent of the parties who entered into the agreement. If the language used is unclear or ambiguous, the court can look to other sources or outward manifestations of the couple’s intent. Disputes concerning postnuptial agreements are sometimes about the circumstances surrounding the formation of the agreement. One spouse may claim that the other spouse used fraud or duress to force the agreement, or that the spouse did not disclose all relevant assets before the agreement was entered. These are all valid reasons why a court may refuse to enforce a postnuptial agreement. This is also why it is important for each spouse to get legal assistance from his or her own attorney before entering into a postnuptial agreement. If your spouse has approached you with the idea that you enter into a postnuptial agreement, you need to speak to your own attorney before signing any documents. There are disclosures that should be made before a prenuptial or postnuptial agreement is entered into, and without the guidance of an experienced attorney, you could be left at a disadvantage. If you entered into a postnuptial agreement and are about to get a divorce, you need to consult an experienced divorce attorney to review your agreement help you determine whether it is valid and enforceable. Contact an experienced divorce attorney at the Media, Pennsylvania law firm Barbara Flum Stein & Associates serving Delaware County in all family law matters to schedule a consultation.